Fantastic location for this beautiful villa which has been fully restored with marble and oak flooring throughout and fitted out with top-of-the-range furniture. About 2500sq feet with 3 large balconies. This is one of the most outstanding villas in a quiet area with views from this part of Villefranche unrivalled anywhere in the world ! 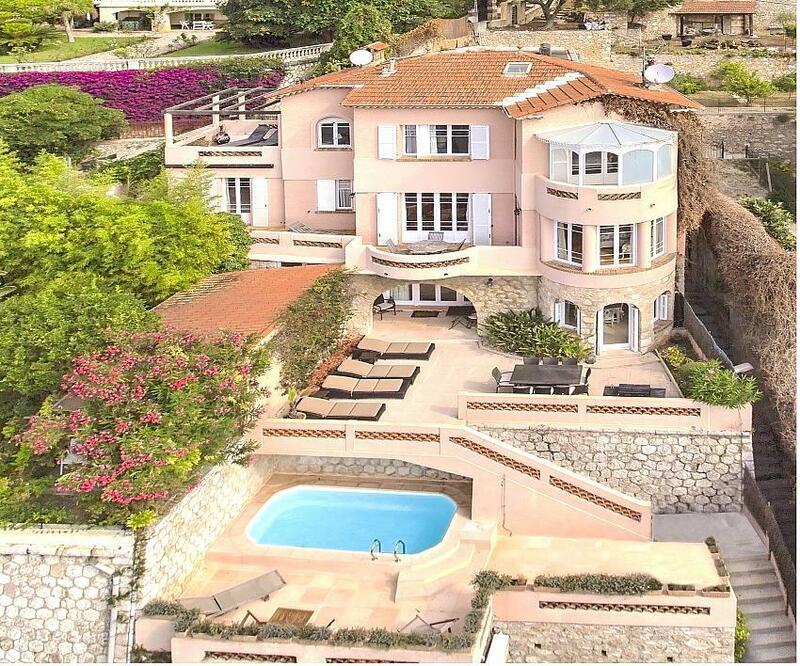 Villa Oursinade is a really stunning property overlooking the bay of Villefranche to Cap Ferrat. It has been modernised to the highest standard in order to ensure ultimate comfort and simplicity. Having been divided into three apartments for many years, this villa has now been restored to its former glory, capable of sleeping up to 9 people, making it the perfect property for a family or group of friends. It has beautiful marble flooring throughout and is fitted with top-of-the-range furniture, with ample space and three walk-out balconies. This villa has just been restored to its former glory, having been divided into three apartments for many years. It has marble flooring throughout and is fitted out with top of the range furniture. There is ample space, with three walk-out balconies. The outside area of Sea Urchin Luxury Villa is a treat, with a BBQ, lots of sunbeds, 3 terraces and a lovely garden; without forgetting the private swimming pool, of course. There is also a garage with room for one car, and ample free parking outside of the apartment. Bedrooms: 4 double rooms - 1 single room. Bathrooms: 4 full marble bathrooms, 1 with bath, 3 with shower. Kitchen Items: Fridge freezer - hob - oven - dishwasher - washing machine - drier. Dining room: Seating for 8 people. Child's high chair provided. General Items:	Linen and towels provided - air-conditioning - central heating - safe. Villefranche is situated between Monaco (Monte Carlo) and Nice ... This is considered the best part of the Cote d'Azur. Cap Ferrat and Beaulieu are both a mere 3 minute drive away. The train station is only 100 meters away, with the train travelling all along the coast to Italy or back to Cannes and Marseilles. Nice center is only 2 stops away, with Monaco 6 stops. Nice international airport is 8 Miles away. - The citadel on the waterfront is amazing, go into the interior through the drawbridge, or go around the sea walkway to the second port called the "D'Arse", where you will find a small beach and an old vaulted galley-slaves pen. The main church in the old town has a wooden sculpture carved by one of these slaves. - Rue Obscure is between Rue du Poilu and the seafront, and is completely unchanged since 1500, making for a very interesting and historical sight. - Cap Ferrat is on the other side of the bay, and has some wonderful beaches such as Fossa Beach, located behind the village. However, parking can be an issue during the summer. - The train is excellent. Timetables available. - Buses on main street. (Nice is a 5 minute ride to "Nice- Ville", and Monaco about 15 minutes). - Electric cars can be hired using a Blue Card, just below main entrance to the village. - Casino supermarket, bakery and newsagent are located in Rue du Poilu, which is a street behind the waterfront. There are other shops on Basse Corniche, below Villa Seriamis. - Super U supermarket, located beside the Beaulieu train station is very good. - Open air fruit, veg & fish market every morning in Beaulieu. - Boat hire can be found on the waterfront through "Dark Pelican". No license needed if one hires a small motoboat. - Beach is on the front and second beach in D'Arse harbour. Beaulieu also has 2 beaches. Monthly bookings: 20% reduction Sept to May. 10% reduction June to August.